Consider it carefully because it is life-changing. If you love food, the art of preparation, cooking, presentation and the traveling, then this lifestyle might be for you. A background in food and beverage is helpful. You’ll need to enjoy teamwork and be willing to go to any length to get the job done. I was in food and beverage for years before jumping into the belly of the kitchen and I have never regretted it, even for one second. Think long and hard before you make this life-changing decision. It is not for the weak of heart. I would recommend culinary school or a three-year apprenticeship under a master chef. Most yacht owners now want culinary graduates or trained professionals. Like any job, there are pros and cons to being a chef on a private yacht, which I would like to share with you. I have found that the positives far outweigh the negatives, but I would like to give you an idea of what is involved. It is not a glamour job, although I have received many emails from people who say they think it is. For some reason, they have an image of a profession with bling, money, and travel to exotic destinations aboard a megayacht. Some of that is true, but it’s also hard work and little time off. And if an owner or captain doesn’t like your food, or if you don’t perform to exact standards, then you can quickly be replaced. Over the years, I have seen more than one freelance stewardess go directly to the owners to ask for my job. I have also seen four crew members from another, major megayacht camp out on my yacht’s back deck hoping for a position onboard. I do have a wonderful employer who I have been with for more than a decade, so I would like to point out what is involved in being a yacht chef, so here are some dos and don’ts I have learned along the way. Be prepared to leave friends and family behind and work long hours for extended periods, sometimes from as early as 5 a.m. to 10 p.m. for as much as two months at a time. Also, a guest may wake you up in the middle of the night to prepare a snack or pizza. Think of your galley like a matchbox. You’ll be cooking in small spaces so organizing is essential. You can’t leave things out or you’ll run out of counter space. Come to the job with a broad repertoire since you likely will be cooking for both the owners and the crew. On smaller yachts, you must be able to plan out the menus for both over an extended period of time. The crew should eat just before the guests and you may have to prepare two totally different lunches or dinners. You will also have to plate the meals differently. If there is more than chef onboard, one for the crew and you, you will need to coordinate the meals and know how to plan far in advance to ensure you don’t step on each other’s toes or run out of anything. If you’re working as a freelance chef, don’t change the galley around to suit yourself. It was set up for someone else and you can work around it. Take a time management course. It will help you plan your time for your meals so nothing is ever late and will show you ways to find time for yourself. In this industry in particular, your personal time is precious and limited, so take advantage of it when you have a day off. Find out everyone’s likes and dislikes, special requests and dietary restrictions. You’ll need to know how to prepare special diets and know where to provision for them. There will be guests, owners and/or crew who are diabetic, gluten intolerant, a vegan or vegetarian and you had better know how to fix each of them simultaneously. This is mandatory on most yachts. Know how to procure produce and meats in other countries. Learn how to handle and prepare them without poisoning someone. Be flexible and make sure you present these foreign ingredients as a finished meal with no mistakes. All these things will test your creativity. Yachting for dollars is a perfectionist’s game. Let me remind the male chefs out there to hide any tattoos, get regular haircuts and wash under your nails. No jewelry or fake nails onboard. Because you are handling food, keep your uniforms spotless. Lack of good sanitation skills will get you into trouble, meaning a food borne illness which I will cover soon. Know your crewmates’ jobs and lend a hand when you have time. In such close living quarters, you’ll need to be accommodating to others. Leave your family problems in your stateroom or at home. If you are a crew team, you must be able to work together without personal issues getting in the way. Don’t let your personal relationships get in the way of the professional relationships. Mind your manners and do everything with a smile. As a yacht chef, you won’t be spending much time with the owners unless they like to hang out in the galley. But you will see them to talk over menus and dietary concerns. Don’t expect to participate in the same activities as the guests, like using the jet skis or the launch or shopping in exotic ports. If you do get that chance, then realize it is an opportunity, not an entitlement. Not every yacht owner wants to share their private time with crew. Some yachts invite the crew to lunch or to dinner. Don’t swear in the galley because it resonates throughout the boat. Don’t do drugs or drink. This is the most important on my list of what not to do. If you’re CUI (cooking under the influence), you could inflict serious injury to yourself or others. Worse, you could start a fire, which can be fatal on a yacht. Also, your food will not be up to par if you drink. If you must drink, do so away from the yacht on your time off and not in uniform and certainly not where you could make a fool of yourself or damage the image of your owner or fellow crew. As for illegal drugs, keep in mind that the boat could be confiscated or impounded and the captain could be arrested. I don’t imagine jail at a foreign port is a good place to be. Don’t expect your own stateroom. On smaller yachts, it doesn’t happen. Most times, a yacht chef will share a stateroom with someone else so be grateful if you have an owner who doesn’t pack the yacht so full of guests that you have to move out of your stateroom. 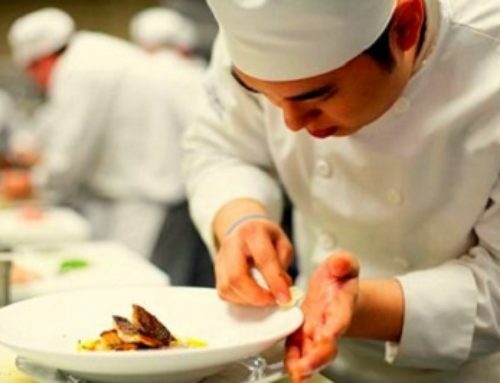 Even if you have graduated from culinary school, don’t expect a top salary. Your compensation will be in line with your experience and credentials as well as the size of the yacht not because you are some hot new culinary rock star. Check with local crew placement agencies to find out what the chef should be paid according to the yacht’s length. Compensation also depends on whether you are going to work aboard a charter or a private yacht. Salaries are negotiable but remember to be reasonable and take into consideration the benefits that the yacht might offer from health insurance to vacation pay, a ticket home once a year and sick leave. In my experience, the positives absolutely outweigh the negatives. The travel is wonderful. You will visit some of the world’s most elegant resorts, playgrounds of the rich and famous, and discover the beauty of the world’s oceans and the nature it holds. The pay is good and you can bank everything because you really don’t have a lot of expenses because everything is paid for including your toothpaste and toothbrush, that is if you don’t have a mortgage, kids, education to contribute to or other payments. If you have time to get out and explore the various places yachts visit, then your world was enriched just by being able to go. You see places and the most exclusive resorts in the world that most people save up to see in just two weeks vacation time or won’t ever see at all. And best of all, you’ll meet some really incredible people who may become life-long friends.